3 Days Ago (3:38 AM). Edited 3 Days Ago by EnglishALT. Hello all! 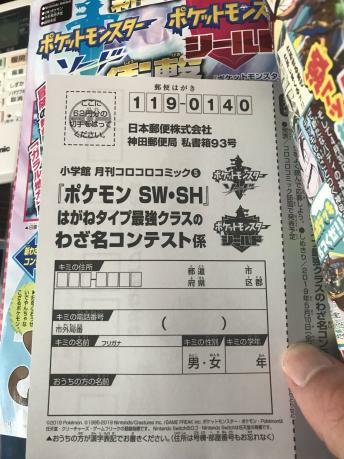 Coro Coro is running a special contest to name a Steel Pokemon attack in Sword and Shield! I have one mail in post card and I decided to give the Poke Community a chance to name the attack! So here is the deal, between April 15th and April 26th at 4 PM Tokyo time, come up with the best attack name! The one that has the most "likes" at the time the contest is finished, will be placed on the postcard and mailed to Nintendo! Remember the attack must be 8 letters or less! Good luck everyone! The contest runs from 4/15/2019 to 4/26/2019 at 4 PM JST. The attack name can be in English, Hiragana, or Katakana. The winner will be determined by number of likes, if there is a tie, I will let the mods decide. A picture of the finished post card will be posted in this topic to show it is being sent in. If Nintendo chooses the attack name as the final choice, the winner will be informed via PM and in this topic. 2 Days Ago (11:08 AM). 2 Days Ago (2:31 PM). Edited 2 Days Ago by tokyodrift. Actually, here's one that works as Romanji: Talos. 2 Days Ago (4:36 PM). 2 Days Ago (4:38 PM). 2 Days Ago (6:19 PM). Edited 2 Days Ago by Leo Van Pyroar. Named after Shrapnel shells because we just passed the 100th anniversary of the end of WWI (in which the UK, the region Galar is based off of, was a big player in) last year so I thought it would be a good way to honor that. 2 Days Ago (6:19 PM). 2 Days Ago (8:54 PM). Edited 2 Days Ago by remer. as nuke means nuclear weapon which is highly damaging and has a relation to metals.And as it is used by a steel type it would seem as if it is launching a part from its body as the nuclear weapon. 2 Days Ago (9:30 PM). Edited 2 Days Ago by charmite40534. A steel type is usually bulky so it would be like the Earths iron core. If it shreds off its own body to launch it at the opponent it would hurt itself but would pack quite a punch since the Earths core is made out of solid iron and nickle. Core Tear could also work unless theres a better word. 2 Days Ago (10:06 PM). Heh an offensive Curse move. Hmm Torment came to mind but we already have that. How about Rust. It's what happens to Steel when exposed to Oxygen. In using the move, the Steel Type Pokemon willingly causes rust to form(which hurts it) and then violently expels it at the enemy. 2 Days Ago (2:40 AM). Edited 2 Days Ago by Diego Mertens. 2 Days Ago (8:51 AM). 1 Day Ago (10:26 AM). Edited 1 Day Ago by Reinhartmax. What about Foil? It's simple, but it refers to metal and how a plan can be rendered unsuccessful, tying it in well with the recoil. 1 Day Ago (10:30 AM). 1 Day Ago (1:00 PM). Edited 1 Day Ago by Leelue. 1 Day Ago (4:50 PM). 1 Day Ago (6:15 PM). 1 Day Ago (10:09 PM). 1 Day Ago (1:35 AM). 23 Hours Ago (10:37 AM). Edited 23 Hours Ago by Endo Halliby. 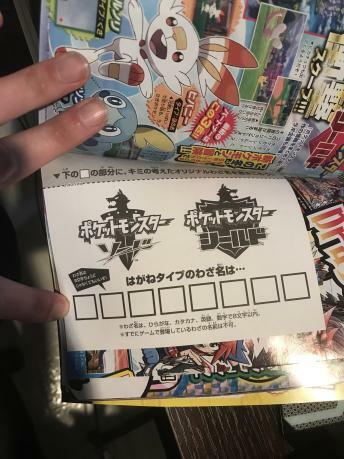 The names of the games are Sword and Shield. As many know, these are the primary weapons of the noble knight. A knight's purpose is to protect his country, and in some cases his princess. He would give his life at the hands of his enemy if it means protecting his countrymen. At the same time, we have seen countless times where a Pokémon nobly sacrifices itself to protect it's trainer. With a strong bond, such a Pokémon wouldn't think twice to sacrifice half of it's health to destroy the enemy. Just thought it fit well. I know I'm not the only one with this idea, so if it does it chosen it'll be from the combined efforts of everyone who requested it. Anyway, thanks for giving us a chance to potentially name something in the franchise we love. 18 Hours Ago (4:06 PM).